- This is currently in a WIP state. if it's an aquatic race, how does it have use for nose and ears, exactly? Also, sharks have noses and they can hear quite well too! Your words "a rather aquatic race" sets up an expectation in the viewer. Most of this expectation is implied as no other information is provided. The common thought that comes to mind is that this guy lives underwater. Anatomy design has many factors. An important one is mobility. Creatures use their adapted bodies to move thru their environment. Certain forms and features are better suited to specific environments with specific types of mobility. Of course an adapted body is not necessary for specific types of mobility with the power of technology. People cant fly so they use airplanes. People cant run 70mph so they use cars. From this characters body and features I imagine he would need and be able to develop similar technologies to get around underwater. Visual theme carries a lot of power (and because art is visual this is important). 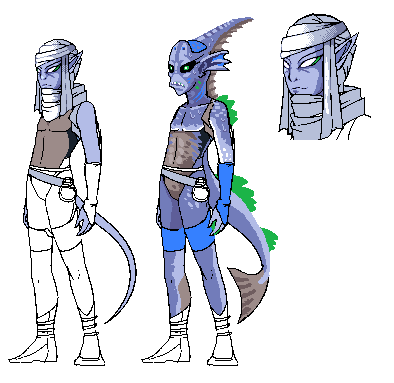 Its not necessary at all to design an aquatic character to have extreme fish like features. However it makes him quickly readable, relates to the natural world, and distinguishes him from characters of other enviroments/classes. Of course character design isnt nature or science. Its enough to just make something cool, whether it fits how we relate it to the natural world or not. Telling the viewer what something is has a lot of power. Just keep in mind that without telling us anything, would we all come to an agreement of what this guy is, where he lives, etc? An easier description to swallow might have been "a race that uses water magic". 1. "Show me, don't tell me"
2. "Always error on the side of more extreme"
The idea being: try stuff, and if it turns out really silly, it's easy to remove. Pushing a design on paper can reveal appealing options that seem ridiculous in the mind. But I'd say dump all of my design choices here and come up with your own. It's obvious that you are going for something different than a fish man. Just a quick thing to add to PixelPiledriver's reply there, the only thing tipping me off that the character is aquatic is that he's blue. Although without you telling me I probably would've thought he was some kind of elf/lizard thing. The clothing sorta suggest that he lives in a desert or any hot place where he's exposed to the sun.. Here is a bowl of psychic goldfish. They communicate by telepathy and zip around on a little cart. I don't expect they will work for your game. I hope by understanding why they won't work that you can better define what your aquatic species needs. What purpose does being aquatic serve? Which real world aquatic species will you draw from, if any? A small sample: squid, crab, eel, shark, jellyfish, turtle, whale, swordfish, shrimp, anemone, these all look very different and can offer much inspiration. If this is concept art (ie. not intended as a presentable final product) then why do it in a notoriously slow & fiddly medium? I'd personally start by iterating with pencils if not a digi-painting sketch. - Although they are primary aquatic, they can live on land, somewhat like Amphibians can. I do quite enjoy your edit, but making them more fish like would certainly drift away from the original idea, I dislike the ideology of all aquatic creatures having to be fish like beings, as this Game does not take place on earth, I presumed no one would worry about the fact they are not fish people, as for adaptations, not all adaptions are visual adaptions, but I do apologize for not giving any detail/information as to where the race lives ect..
- Although they live in the sea, they can walk on land, and breath like any human, but as their skin is not adapted to the heat the sun would provide, they tend to wear desert like clothing to remove said factor of heat that could harm them. Thank you everyone for your help, I don't tend to change the concept to such an extent, but I will eventually add some visual adapations, as for now, I simply fixed the chin, as suggested, and carried on with the body.